Marketing can be hard if you don’t have the right online marketing strategies. In fact, every business has to learn how to market itself – or risk failing. I’ve seen my fair share of failed businesses which had amazing products and services but it just did not work out business-wise. Why do you need to market your business? I had this idea to create an e-commerce clothing store for other teenage girls like me. The only trouble – I didn’t know how to market my stuff and get customers! Starting an online business is only one part of the process, you still have to market it. I decided to observe my competitors and find out how they marketed their e-commerce stores. If I had this guide, my life would have been so much easier as I would know exactly which online marketing strategies to use. 1. SEO optimize your content: If you’ve written content on your blog, you definitely want to optimize your content for keywords. This will get you a lot of search traffic. Need some SEO blog tips? 2. Create an attractive website: A great-looking website helps you to create a brand that stands out and creates a great + professional first impression. If you need a website but haven’t been able to your dream website up yet, check out Your Stunning Website, my done-for-you website kit that comes with the premium Divi theme for a fraction of its price. 3. Create social media profiles: Today, even your grandma will search for a social media presence to see if a business is legit. Not to mention, social media networks are a great place to market your business. 5. Connect your personal Facebook profile to your Facebook business page: This does a few things. Your personal contacts will see your business and may give you a referral. Also, when you network with other Facebook business pages or in Facebook groups, they will naturally go to your profile trying to find out more about your business. You can do this by adding your Facebook business page as your current workplace and setting the privacy for that to public. Want to join my Facebook group with thousands of bloggers and online entrepreneurs? Join here. 6. Get on Facebook Live / Periscope/ other live streaming tools: In today’s noisy internet world, going on LIVE will cut through all the noise, allowing you to engage with your audience very quickly. And that’s what you want, right? 8. Hold a viral giveaway: Not just any giveaway – your giveaway should have a viral component. Give people who share the giveaway more points. If your prize is truly valuable, your business could blow up (in a good way) in a matter of days. Use Kingsumo for this. 10. Put up a recorded video about your offering: In a few minutes, you’ll be able to tell someone new 1) what you do 2) how you can help them 3) and why they should buy. Have the video be used as marketing collateral – as an ad, on your social media profiles to engage your audience. 11. Create an infographic and share it: Well-designed infographics are highly sought after. Create a great looking inforgraphic, pin it to Pinterest, share it across multiple communities online. Infographics have a very high chance of becoming viral. 12. Join Facebook / Linkedin groups: The effectiveness of this will depend on which industry you are in. Join groups that have a ton of your ideal clients in them, this will help you understand the problems that potential customers are facing. You will also be able to directly interact and promote your business to members. 13. Share on Google + Communities: Google+ may be more or less dead, but Google+ Communities are still very much alive. Depending on your niche, this may or may not work for you. Google+ Communities work like Facebok groups – your ideal clients may be there. 14. Get on Twitter and start talking to people: Use the search bar and search for people tweeting about relevant keywords related to what you do. Hit reply. Bam. 15. Initiate joint ventures with other people in your niche: These people should preferably be non-competitors – both of you can share your audiences and grow together. For instance, you could pitch someone with a larger audience to hold a joint webinar with you, and then you can offer a great freebie of yours on the joint venture webinar. 16. Join someone’s program and become their star student: They will have an incentive to promote and mention you because it puts them and their product in a good light. 17. Don’t hesitate to praise your competitors (or anyone for that matter): If you have tried a particular technique someone taught and saw success with it, make sure you let them know. You may be featured! 18. Be a guest teacher in someone else’s program: This showcases your expertise, and positions yourself as a leader in your field. You can also introduce your product/ service as an up-sell to what you are offering as a guest teacher. For instance, if you’re a lawyer you could teach people how to protect their legal asses… and then sell them template contracts or consultations. 20. Create freebies and repeatedly request for people to share: If you’ve created something good, people will want naturally want to reciprocate by sharing your work with the world. Focus on creating a lead magnet that’s amazing. 21. Conduct a free challenge: Create an actionable challenge (for instance: like my free 10-day build a profitable blog + biz challenge) to engage your audience, you can even pitch them a product later. 22. Offer people free spots to your course/ to get on a free call with you: Most people are afraid to give out free stuff because they are afraid that it will “devalue” their brand. Let me ask you – would you rather be invisible or to help someone and have them rave about you? When you’re just starting out and can’t get anyone to pay you *yet*, I find that it is wise to offer complimentary sessions, get people results, have a ton of testimonials to prove that you know your stuff. They will naturally recommend new customers to you, PLUS you now have testimonials to show potential customers. The only cost? Your time, or the cost price of your product. 23. Leverage on holidays to boost sales: People are in the mood to buy and it gives them a natural deadline to purchase! 24. Get on directories like Yelp and Google Places: This is a MUST if you’re an offline business hoping to market your business online. 25. Paid social media traffic: Don’t have the patience to wait for organic traffic or word-of-mouth to keep in? The fastest and most efficient way to market your business is via paid traffic. You could have a profitable business up and running by tomorrow, if your positioning and offering is right. There are many different ways to do this on social media: Facebook ads, Twitter ads, Promoted pins, etc. 26. Other paid ads: There are other ways to get paid traffic too, not just social media. Some examples: Google Adsense, banner ads, etc. 27. Create your very own affiliate program: This is an amazing way to get more customers – get other people to market your business and then give them a commission. Part 1. What is Affiliate Marketing, And How Does it Work? 28. Guest post on larger sites: Guest post on larger sites, it allows you to tap into someone else’s larger audience. Also, guest posts have a relatively long shelf life. You keep getting subscribers from the guest post for as long as the post still exists. 29. Send press releases to get coverage for your business. 31. Have a great launch party whenever you do something new: This creates hype, gets people’s attention focused on you, and gets you on the radar of potential customers. 32. Republish your content on Medium: Medium is a great platform to share your thoughts, and you can republish your posts there to get even more eyeballs on your content after you’ve published it onto your website. 33. Use Wisestamp and update your email signature: Wisestamp acts as a walking billboard for your business whenever you send or reply to emails. 34. Get friendly with other peer bloggers – support and grow each other: Arguably, this is not something I am naturally good at as I am a huge introvert. However, I can attest to the benefits of networking. You get more linkbacks, you get more support, you promote each other’s stuff… it’s great for your soul, and for everyone’s businesses as well. 35. Host your own Podcast: People who listen to podcasts may not typically read blog posts, so you’re reaching a whole new audience here. Bonus points if you get a ton of great reviews and start getting even more traffic via iTunes. 36. Host your own interview show on Youtube: Youtube is its own search engine by itself, there are SO many people on Youtube right now who could be your potential customer. 37. Write testimonials for people: I’m a huge believer that being nice to people will reap you rewards. If you’ve benefited from a particular tool or business (for instance, for my niche, it would be if I find a great blogging tool or worked with someone related to my niche), write a testimonial for them. Especially peers and people in the same industry. They will likely publish it on their website, which gives you more exposure as well. It’s truly a win-win. 38. Help influential people out: Do tasks/ promote their things/ be an advocate for their business/ buy their stuff – in general, be helpful – they may reciprocate in the future. One tweet from someone big may catapult your business. 39. Be controversial: We live in a world that thrives on “breaking news” and stuff with a “shock factor”, unfortunately. Write a post against the norm and promote the heck out of it. Here are some catchy headlines that will grab people’s attention. Woah! 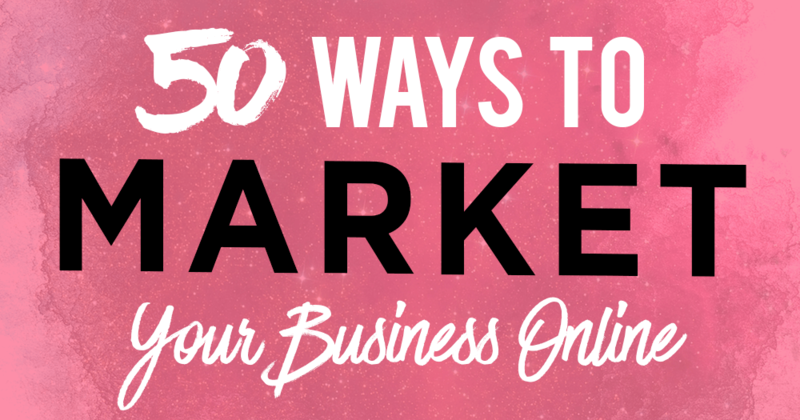 50 awesome ways to market my business online? Heck yeah! 40. Use relevant hashtags on Instagram: If you’re on Instagram, start adding hashtags to your picture captions (or in the comments). Hashtags are a great way to get exposure on Instagram. 41. Add your freebie/ product offering into the profile description of all your social media accounts: You’ve gone through all that trouble to create a social media profile. Leverage on it! Convert people following your social media accounts into subscribers or customers. 42. Create content and pin them consistently onto Pinterest: Pinterest is THE up and coming search engine everyone should be leveraging on. Write great content, create attractive pins for each post and pin them onto Pinterest to get traffic from there. 43. Connect with people liberally on Linkedin: Take the extra effort to talk to people on Linkedin. Connect with as many people as you can. Be a Linkedin superstar. Invite them to hop onto a free call with you and tell them how you can help them from there. 44. Use Help A Reporter Out (HARO): HARO is a great site where reports post what they need help with. You can respond to these queries and potentially get featured on a big site! 45. Get interviewed: Get interviewed on someone else’s podcast, youtube channel or more. This will give you more exposure – their audience will get to know about you and your business! 46. Participate in forums: Participate in forums, make sure to mention your url/ or your opt-in bribe in your forum signature. 47. Repurpose blog posts and place it on Slideshare. If your presentation gets featured on the front page, you’ll have a surge of people coming over to your website! 48. Leverage on online marketplace sites: Don’t want to bother with creating an audience, but still want to sell your stuff? Make use of marketplace sites like Udemy, Etsy, Ebay, Amazon etc that will help you to get customers in exchange for a commission. 49. Offer your products/ services to bloggers for free in exchange for a review: Bloggers, especially ones that aren’t that popular yet, are very likely to do a review of your product in their blog post(s) if your product is good. 50. Always overdeliver and impress the socks off ALL your customers: Last one, but the most important. Always overdeliver for ALL your customers. All businesses thrive on word-of-mouth. Getting exposure for your online business does not have to be hard. I hope that you’ve found this useful. Start marketing your online business now, you rockstar! You are an inspiration. I love you content on this subject. It makes me laugh when people say I don’t know how to reach people online. These 50 ways are amazing. A lot I knew but you sure made me think. Great practical ideas, thanks. It offers some new perspective for my Entrepreneur Life Skills Programs.